Bringing the Truth back to hip-hop with blazing beats and strong lyrics. Mark 1:17- "Come, follow me", Jesus said, "and I will make you fishers of men. In the spring of 2002 Dre Murray heard this same voice. It was a voice that he had heard for a very long time, but this time he would answer the call. Dre Murray would soon leave behind a life full of sin to except a life full of peace that passes all understanding. Dre Murray was born in Houston, TX on Sept. 14, 1981 to Mr. and Mrs. Marjorie Murray. Before he would be able to speak his first words his mom and dad separated. He was raised by his mother and grandmother and was the youngest of three boys. As he grew older Dre Murray began to grow fond of sports and music. At an early age he began to play organized sports as well as writing music. His love of sports would see him except a full basketball scholarship to Southern Nazarene University in Oklahoma City. Hundreds of miles away from home Dre Murray began to fall into a life full of drugs, alcohol, and lust. He continued to do music while in school, but his lyrics began to reflect his lifestyle. In December of 2001 Dre heard the voice that he had been running from for many years. It was the voice of the Lord calling him to repentance, but fear of persecution from friends turned him away. In April of 2002, Dre Murray became very ill and was diagnosed with pneumonia. He became very weak and was confined to his dorm room for a couple of days. In a dream one night Dre Murray pictured himself being struck with a fatal disease and the thought of not knowing the destination of his soul became a frightening reality to him. That night Dre Murray came back to the Lord and accepted the Gift of God, eternal life through Jesus Christ. As Dre Murray began to study the Word of God he felt the call to use his musical gift to uplift the name of Jesus. He began to write and compose songs full of love and the message of hope. He began to minister at different churches throughout the southwest region performing the music that God inspired him to write. On Sept. 6, 2003 Dre Murray was married, and he and his wife reside in Oklahoma City. He and his wife are working hard to start up there record label and entertainment company Blueprint Movement. The first release will be Dre's new cd entitled The Mirror which will be in stores early 2005.
go to http://www.mp3.com/dasouth and listen to the whole version of "Get Ya Mind Right" and "Oh Yeah"
This music is very poignant. It is direct and seems intended to hit the mark, the heart, off the flow chart. The vocals are full and understandable. Though eloquently racy the lyrics are not demeaning to gender or ethnicity. The music tracks are not sequacious and are not limited to a certain style or truculent delivery against the mind of one with a rebutted worldview. The true heart of this artist is shown throughout the CD and in the delivery sent. Any future projects from Dre would only add more flavor to the excellence already presented. TIGHT beats! Number 14 is that fire! Great writing, thorough message ... I'm officially a fan and supporter. I'd love to see y'all live. Being a white middle age male NOT raised in a ghetto, I wasn't sure how much of this disc I was going to relate to. I was captivated, engaged and enthralled with the power of Dre's message and music. Project Ghetto packs a punch of truth anyone can relate to and enjoy who has found a higher calling and experienced a life transformation. I especially liked 'Real vs Fake' which challenges Christians to act as one ("there ani't no halfing it dawg!"). 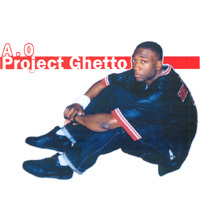 A.O is crunk, pick up the album if your from da south, it is tight! I haven't heard the whole cd, but from what I have heard it's great, and he is absolutly awesome live! AO is young saved and dangerous!!! i knew the prophet in oklahoma and now we in el paso tx together. if the rest if the group is humble like he is the industry is in trouble . he promote AO cd like his own and he is far from selfish. AO you get 6 stars my man...and dont make me wait to long to hear Prophet. oh yeah Garbage goes off!!!! This cd is tight from start to finish. Dre' Murray held it down on this one. His flow is on point and the beats are hot. Keep doing yo thang man.